Title: UP AC-4400CW # 6826 leads an eastbound detour train at Mesa Rd. Description: Near sunset on an August evening. Description: UP 6826 leads eastbound coal train. Title: Union Pacific C44AC 6826 draws duty as the "back engine." Description: Headed up the Springfield Sub. for a meet with the Heritage Units is UP Train GSPGRK 02 with GE Power. Description: Union Pacific. # 6826, 6224, and 5744 southbound stopped north of the Baker St crossing. Title: UP 6826 trails 2nd out on a sb coal load. Description: UP 6826 waits between assignments at UPs Global 3 Yard in Rochelle, IL. Title: UPRU 948005 - Union Pacific "Arrowedge"
Description: While up in the crosswalk at the former ATSF station in Fort Madison, I spotted a strange airplane like object on top of the first container in the UP train. It was my first sighting of an "Arrowedge" device. Description: Developed by Union Pacific emplyees, this object was designed as an environmental friendly aerodynamic device. 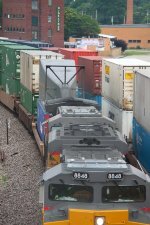 Positioned on top of the first freight container, the 48-foot Arrowedge® has a tapered body that allows air to more easily flow around the train's top frontmost containers. This reduces aerodynamic drag for more efficient transport of customers' goods. In addition, drag reductions decrease the amount of locomotive power required to propel the train.